Sandra Shackleton (Irvine GC) and Margaret Morrison (Troon Ladies) contested the final of the McCall Salver today at Loudoun Gowf Club. The weather behaved, it was very pleasant out and stayed dry. The final was a very friendly match and produced a close front 9 with Margaret edging ahead by one hole as they made the turn. Margaret then moved to 3 up after winning the 11th and 12th. Sandra staged a comeback by then winning 13 and 14 but a 3 putt on 15 gave Margaret a 2 hole advantage with 3 holes to play. 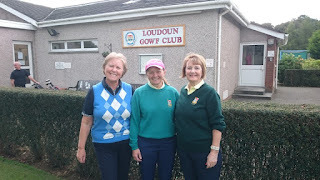 Many thanks to Loudoun Gowf Club for the courtesy of the course and to Captain, Liz Keohone for refereeing the match. Forty four competitors at West Kilbride, turned out to be quite good weather but the course was playing tough! CSS for today was 76 and it was Reduction Only. I guess local knowledge came in handy! 9 girls competed for the St. Nicholas Trophy yesterday at Barassie Links. Playing conditions were exceptionally difficult with cross wind speeds of 40+. However, this did not deter Alison Malcolm (Prestwick St. Cuthbert) who had an excellent round of golf. Her nett 78 (SSS 76) won by 6 shots over West Kilbride's Claire McLaughlin. Alison's scratch 92 won the prize in the qualifier for the Telegraph Junior Golf competition, and as scratch winner on the day will go forward to Scottish Golf's Junior Champion of Champions at the Dukes on 22nd October. Pre-handicap girls Katie Ronnie (Barassie) and Kirsty Shaw (Dalmilling) played 9 holes, Katie finishing just ahead of Kirsty. Pictured above are the girls who took part in a Friendly Match between Dumbartonshire & Argyll and Ayrshire. Played at Milngavie on a beautiful sunny afternoon, the girls all enjoyed their games and the opportunity to meet new friends. Julia Thomson (D & A) beat Rebecca Hale (Ayrshire) 5/4, Freya Russell (Ayrshire) beat Sophie Murphy (D & A) 4/3, Zara Mason (Ayrshire) halved with Cristina McCracken (Ayrshire on loan to D & A!) so a very friendly halved match. Thanks go to Milngavie for their hospitality.